The home of Rock N’ Roll the Lakes Bike Ride, at the crossroads of Interstate 35W and I-80, Albert Lea, in southern Minnesota offers many family-friendly biking opportunities. Select from the picturesque ride around Fountain Lake, a ride out to the State Park on the Blazing Star State Trail or tour countryside of Freeborn county. Then after your ride take in the art, history, and music the community here has to offer. Known as the “Land Between the Lakes,” Albert Lea is nestled between Albert Lea Lake and Fountain Lake. Geographically located at the crossroads of Interstate I-90 and Interstate 35W in southern Minnesota, this charming community is about 90 miles south of the Twin Cities. Both the city and the lake were named in honor of Albert Miller Lea by Joseph N. Nicollet. Nicollet explored and mapped streams and lakes in this county in 1835. 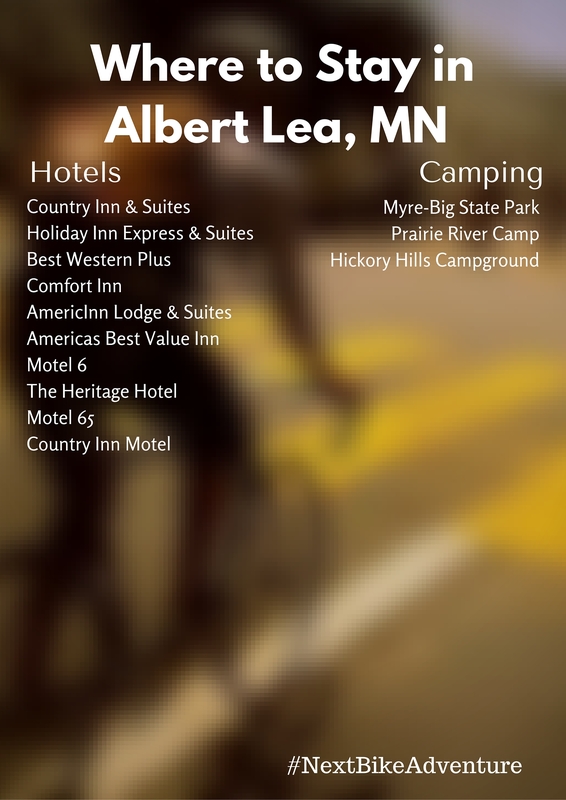 Today when exploring Albert Lea, you will find a relaxing setting to bike with family and friends while enjoying some of southern Minnesota’s hospitality. Albert Lea was one of the first cities to take part in the Blue Zone Health Initiative. 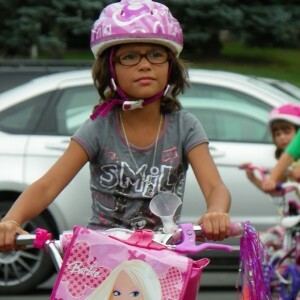 Here this young lady shows off her new bike after finishing a bike rodeo at her school in Albert Lea, MN. Along with the paved trail running out to Myre-Big Island State Park, many recreational trails will allow cyclists and walkers to enjoy the area. In addition, there are many bike friendly streets and rural roads to explore the countryside. If you are interested in exploring Albert Lea’s nature-based sides, one of the best ways is by taking the Blazing Star State Trail. The trail is currently paved from Albert Lea Lake to Big Island State Park, a distance of approximately six miles and it connects to Albert Lea’s city trail system. Future plans are for the trail to connect to Austin’s city trail system, as well as the Shooting Star State Trail. 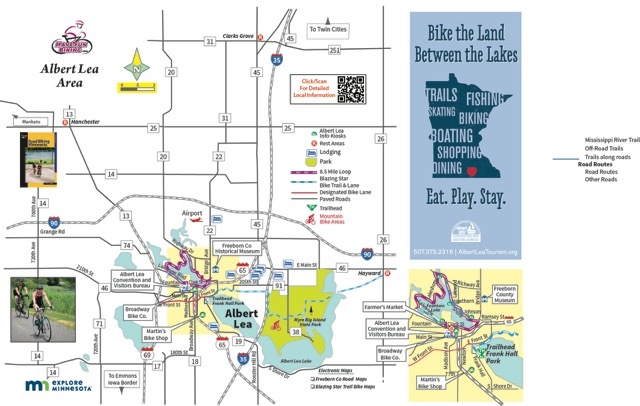 When completed, the Blazing Star State Trail will be approximately 20 miles long and connect Albert Lea to Austin via Big Island State Park. Trail users will enjoy views of rural landscapes along the entire trail. Big Island State Park has the opportunity to experience a diversity of natural environments including wetlands, oak savanna, big woods and prairie. The park is considered an excellent birding spot in southern Minnesota, especially during spring and fall migration. 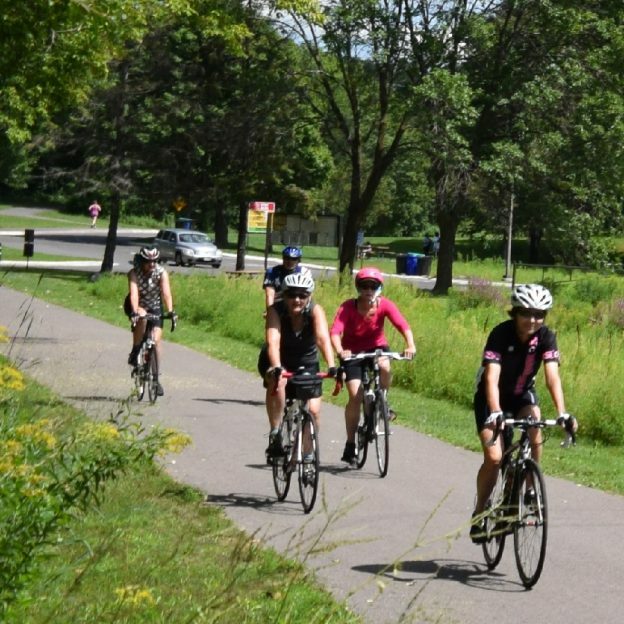 Broadway Ave. And Fountain St.
Rock N’ Roll the Lakes Bike Ride July 13, 2019 – A fun ride for the entire family, choose between three routes. Along with the favorite chain restaurants, when out exploring Albert Lea you’ll find that it has some local restaurants that will give you a one of a kind experience. 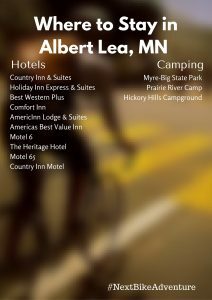 With many lodging properties to choose from, the area around Albert Lea provides visitors with their preferred lodging setting from trusted hotel brands. B & B’s and lodges. When Exploring Albert Lea, find some great places to stay overnight. Along with most hotels, many coffee shops and restaurants have Wi-Fi availability. The public library is another good option. The library here is located at 211 E Clark St., Albert Lea, MN 56007 with their phone number being 507-377-4350. See the Albert Lea Tourism Bureau for more detailed information on your next trip to exploring Albert Lea. This entry was posted on May 27, 2016 by Russ Lowthian.